Once in the family, there are just some players who are destined to break your heart. This was certainly the case with one of the pitchers who wore this number, but two other hurlers for very different reasons are not far behind! 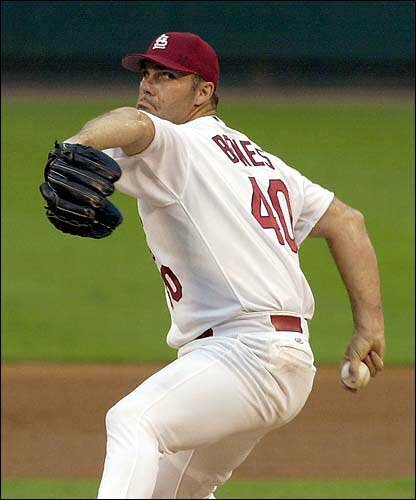 Out of the pair of Benes brothers who adorned #40, Alan actually wore it first in St. Louis before gifting it to his older sibling. What I remember most about Andy was how he was the hired gun brought in before 1996 to turn things around for the Cardinals. Maybe that was not fair given just how much was changing around the entire organization, but when you are brought in to be the ace it goes with the territory. He didn’t disappoint either, at least if you want to look at the regular season body of work, taking home a third place finish in the Cy Young race. Andy endeared himself to a rabid fan base hungry for winning by carrying the load and leading the Birds on the Bat one game away from the World Series. That October still stings, however, given how much the baseball gods wished me to eat my words against Atlanta. Up 3-1 against the defending champs, St. Louis completely unraveled and in the process forever kept me from wanting to put money on the Cardinals. Fast-forward twelve months and another bet was about to pay off, this time for the guy now known as THE agent of the sport. Scott Boras hasn’t changed much over the years, as it appears the same tricks of 2015 worked well before the days of modern social media. Andy let his representative go to work and was able to build off a pair of strong seasons, waiting until February to sign with Arizona. That was as crushing a blow as I can recall, and it didn’t matter to anyone but Fredbird that he attempted to right the wrong by returning in 2000. By that point he was no longer an ace and couldn’t get St. Louis past the NLCS hurdle. If you were hoping the heartache would have stopped there, it may be time to stop reading! Miller was well on his way to becoming a potential ace as well, but that will now be up to the Braves to find out. Depending on how things end up working with Jason Heyward, that deal could end up a distant second to by far the ugliest having to do with today’s digits. Steve Carlton won a world title with the Cardinals and had already established himself as a perennial All-Star before a famous falling out had him on the way to Philadelphia. The straight-up deal for Wise before the 1972 campaign may very well be the worst in St. Louis history. Lefty sailed to the Hall of Fame while it would take another decade for the winning ways to return under the Arch. We hope you enjoyed the first ten as much as C70 and I did reliving some of the highs and lows that come with having so much great history. Now it is time to usher in a new wave of memories (and hopefully some position players) as the calendar turns ever closer to April!